Rockstar Media is a young dynamic company concentrating its efforts in the areas of Artist Management, Production, Songwriting, Touring, Music, Art & Travel Workshops and Entertainment Events. the Rockstar Media Homepage and sign up for the Rockstar Media Newsletter. 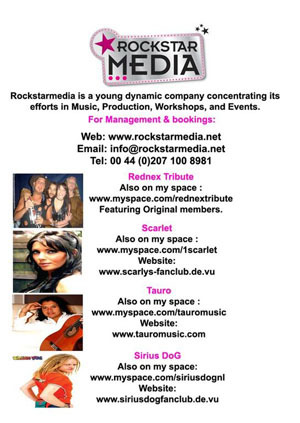 Note: The Rockstar Media Webshop is NOT part of www.Scarlet4ever.com or its subdomains. It is solely run by Rockstar Media Management.